The plaque commemorates the naming of Gloucester Road in honour of the Duke of Gloucester's visit in 1934. 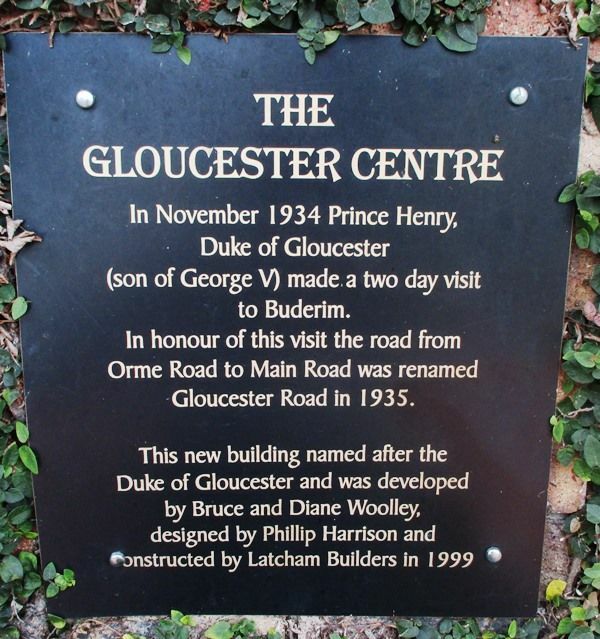 The Gloucester Centre has also been named after the Duke of Gloucester. In 1934, Prince Henry, the Duke of Gloucester and son of King George V, made a two day visit to Buderim. To commemorate the visit the road from Orme Road to Main Road was renamed Gloucester Road in 1935. Dealing with the beach improvements scheme for Mooloolaba and Point Cartwright, Councillor Murphy said that the plans and specifications had been passed. The cost would be £306, and the Buderim end of the division would not be expected to pay any extra rate to meet the expenses of the loan. The subcommltee for the naming of the streets has completed the work, one of the principal streets being called Gloucester Road, in honour of the Duke's visit, and another Orme Road, after the Governor. Courier-Mail (Brisbane), 31 July 1935. Note: The plaque states that the Duke of Gloucester visited Buderim in November 1934. The Duke stayed at Buderim on the 8th & 9th December 1934.